Industry Issue: Are specimen-of-use requirements fit for purpose? In today’s cost-conscious corporate environment, litigation is usually regarded as a last resort in the event of infringement – but sometimes it is the only available solution. In such cases it is important to ensure that you have the right strategy in place, both to maximise the chances of success and to ensure that resources are properly allocated. Over the following 23 pages, WTR presents an examination of strategies and best practices as they relate to the US litigation landscape. Plain packaging for cigarettes – Australia leads the way, but will others follow? The new generic top-level domain (gTLD) Trademark Clearinghouse has revealed that the cost of submitting trademarks will be capped at $150 per year. 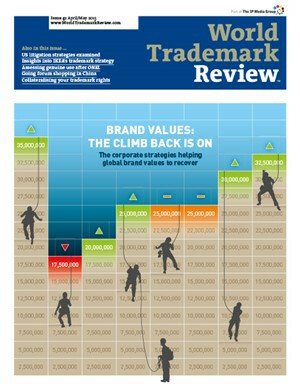 According to draft European Commission proposals obtained by WTR, the European trademark system is set for a shakeup. A renamed Community trademark (CTM) and Office for Harmonisation in the Internal Market (OHIM), the abandonment of examination on relative grounds and reduced application and renewal fees for CTMs are among the potential changes. Following two years of consultation, China’s National People’s Congress has released a draft of the revised Trademark Law for public comment. In Already LLC v Nike Inc (Case 11-982), the US Supreme Court has held that a broad covenant not to sue can be sufficient to moot an underlying case or controversy, thereby removing the basis for jurisdiction for a court to decide counterclaims seeking to invalidate a trademark. The European Court of Justice (ECJ) has issued its long-awaited decision in Leno Merken BV AG v Hagelkruis Beheer BV (Case C-149/11), better known as the ONEL case, which addressed the requirement for ‘genuine use’ of a CTM. The ECJ held that proof of use of a CTM in one member state can in principle, but will not necessarily, be deemed sufficient to prove genuine use in the Community. The High Court of Australia has held that Google did not engage in misleading or deceptive conduct merely by displaying search results generated by advertisers’ wrongful use of third-party trademarks as Google AdWords (Google Inc v Australian Competition and Consumer Commission ( HCA 1). The final (?) conclusion of ONEL – one step closer to cracking the ‘genuine use’ nut? The ONEL decision was much anticipated, the issue of genuine use of a Community trademark long being a hot topic of debate. So is this the end of the discussion or just the beginning? Does the creation of a specialised IP Court shift trademark prosecution towards litigation?